Use your garden fresh zucchinis for this light, fresh meal. Garnish with lemon slices and shaved Parmesan cheese if desired. Shred zucchini using the large holes of a box shredder, yielding about 4 cups. Place on paper towels and pat dry. In a large bowl, mix together zucchini, green onion, breadcrumbs, flour and eggs. Heat 2 Tbsp of olive oil in a large skillet over medium heat. Drop 1/4 cup of zucchini mixture for each cake. Cook for 3 to 4 minutes, turning halfway through, or until lightly browned. Repeat with remaining zucchini mixture, adding more oil as needed. Serve with warm Pasta Sauce. 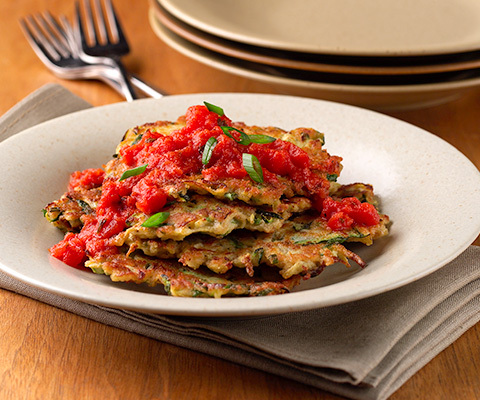 To serve as an appetizer, prepare smaller zucchini cakes using 1/8 cup of batter for each. Makes 24 appetizer servings. If desired, substitute Classico® Marinara with Plum Tomatoes & Olive Oil Pasta Sauce with Classico® Traditional Sweet Basil Pasta Sauce. I made these last night and they were really good. I used Classico's carmelized onion and garlic marinara sauce. I made fettucini, put the cakes on top, sauce, then mozzarella cheese and my entire family enjoyed the dish. Such a treat. Needs a little more bread crumbs to bind properly.